Chelsea 4-2 Tottenham: It's goals that win you games. 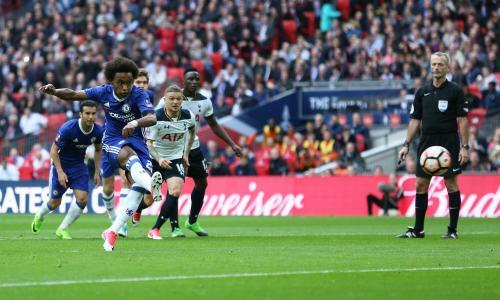 Chelsea beat Tottenham with goals from Willian (2), Eden Hazard and a stunning strike from Nemanja Matic to set up the FA Cup Final against Arsenal on 27th May. I have to be honest, heading into the game after a poor performance against Manchester United last week and with the reported illnesses that had swept through Cobham forcing Gary Cahill into hospital for two days in the build up, I was nervous ahead of this one. I had felt confident heading into every game we had played since Conte had made his tactical change at Arsenal but this was different. We had all speculated as to who would replace Gary Cahill after the manager confirmed that he would not be available for the game. I had made a case from John Terry with possibly Willian and the returning Thibaut Courtois as the three changes to be made to the side that had lost at Old Trafford, I had stated that a side led by John Terry at Wembley, in the current circumstances would be better than a side without him. I was wrong. 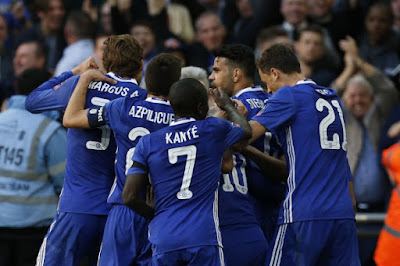 What I didn't expect was Antonio Conte taking the decision to rest Diego Costa and Eden Hazard to the bench, along with Gary Cahill I stated on social media that it was bold move by the manager but with Willian and Michy Batshuayi in as their replacements with Nathan Ake in for Gary Cahill, we still had a side more than capable of causing Tottenham problems. Courtois, Azpilicueta (c), Luiz, Ake, Moses, Kante, Matic, Alonso, Willian, Pedro and Batshuayi (Note that it was a nice touch to hand Cesar Azpilicueta the armband). As the game started I really didn't know what to expect on the massive Wembley pitch. 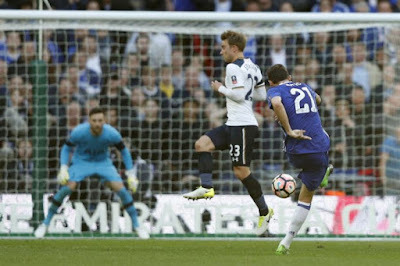 Tottenham were on the up and on a roll, Chelsea had something to prove and I honestly believed it would be a tight, tense game until early on as Pedro was brought down outside the box giving us a chance to test Hugo Lloris in goal early. 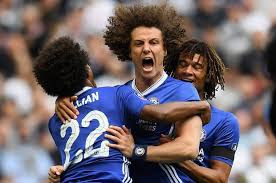 David Luiz and Willian both discussed the opportunity to shoot and it was left to Willian to curl an effort into the far corner giving Lloris no chance to make it 1-0 Chelsea. It was a fantastic start for us. It's important to be honest and to pay full credit to Tottenham here. We had got our goal and became happy to dig in, remain compact and sit deep, soaking up pressure giving Tottenham possession of the ball. The problem was, Tottenham are such a good, strong side now that you simply cannot afford to do that because eventually they will create good chances to score. Five minutes or so after we had scored, that man Eriksen was given time to whip another cross into the box (as he had at White Hart Lane twice earlier in the season) and Harry Kane at the front post flicked a header past Courtois in goal into the far corner to make it 1-1. Tottenham were now well on top in the game and were playing really well. Chelsea were dropping deeper and deeper which caused us immense problems. The fact that David Luiz walked away with the Man of the Match award speaks for itself supported by the impressive Ake and Azpilicueta. Chelsea had no out ball and when we did, it came back far too quickly. Batshuayi up top was doing his best but up against two defenders he struggled. As a result, a huge gap formed between our midfield and Batshuayi and it was easy for Tottenham to regain possession and come forward in waves. Tottenham came forward in what had turned into a really open game and Chelsea dug in, sat deep and worked tirelessly hard to close the ball down. It appeared that this would be the routine until late on with a moment of madness from Son in the box. Victor Moses played extremely well in the game and spent the most part inside his own half supporting the back three. When he did get forward he did give the opposition something to think about with Son, playing left wing-back almost, given the role of tracking back to cover him. As Chelsea had picked up good possession in the Tottenham half, our movement off the ball had created space for Moses to move into wide right. The ball came out to him on the edge of the box and as he stepped inside the box, Son decided to go to ground and make it easy for Moses to knock the ball passed him, feel the contact and go down. The Referee awarded us a penalty and Willian stepped up to send Lloris the wrong way to make it 2-1 Chelsea totally against the run of play. Lloris was a lucky boy right on half time too. As the ball is played up to Batshuayi, he comes out of his box and to collect the ball and handles the ball from outside the box, back inside the box to pick ii up in plain view of everyone apart from the officials who miss it and do not award anything. Second half no changes and we go again with Chelsea starting the better. However, as with any London derby, the game swings one way to the other and within ten minutes of the restart Tottenham were level. Now this is what frustrates the life out of me and did on Saturday. Anyone who takes a look at Tottenham can see that their main attacking threats are Kane, Alli, Son and Eriksen. Son was playing as a wing-back so not a concern in this game. Kane had already capitalised on another Eriksen assist to score in the first half so what of Deli Alli? Once again Eriksen moved into space in our half, this time right of centre. He spots Deli Alli making a run into the box INBETWEEN two defenders and plays a sumptuous ball right on the money for Alli to hit it first time, on the half volley into the roof of the net from 12-yards to make it 2-2. It was a hammer-blow at the time and I have to be honest, I was fearing the worst as Chelsea couldn't create anything going forward. Tottenham were well on top and dominating the ball, winning possession back quickly from us and it looked as though we would do well to hang on. In our defence, there were only half chances created despite Tottenham's claims for a penalty as Nathan Ake goes to ground on Alli inside the box. The subsequent replays show you that Ake timed his tackle to perfection and won the ball. With around 25-30 minutes of the game to go, Antonio Conte decides to make changes. On comes Eden Hazard for Willian and Diego Costa for Michy Batshuayi. In that moment the game changed. Chelsea now had an out-ball in Costa and a focal point, we had Hazard who was more than capable of holding the ball up or taking his man on and Tottenham were forced into a change as a result. Kyle Walker came on for Son with Trippier moving to the left in order to stop Hazard. Tottenham were now not as dominant in the game and with the introduction of Cesc Fabregas on 74 minutes for Pedro, Conte's changes were about to influence the game exactly how we wanted. A Chelsea attack forces a corner on the right hand side. Fabregas swings it into the box and it's half cleared, comes out to Eden Hazard unmarked just outside who blasts a low left-footed drive through the mass of players in the box, passed Lloris into the far corner to make it 3-2 to Chelsea. At that point, Tottenham were beaten, having been the most dominant side on the day, the goal was a blow and you could see it as their heads dropped. They now had to chase the game which is something they haven't had to do for a while in the League. Chelsea were back on the up and again knocking the ball about, holding the ball up and looking to now dominate the ball. Although they knew that they had to push forward and chase an equaliser, they had Costa and Hazard to deal with up top. Five minutes later, on 80 minutes, Chelsea sealed their place in the Final with a screamer of a goal from Nemanja Matic. Chelsea had won possession of the ball and push up on our right hand side. The ball comes to Eden Hazard who moves from right to left across outside of their box and he lays the ball back to Matic who is standing 30 yards out in the middle of the pitch. Without hesitation, he steps forward onto the ball and unleashes a left foot strike that send the ball into the far right top corner, hitting the underside of the crossbar and into the back of the net with Lloris standing their not having moved. No one in the world would have saved it, Chelsea were now 4-2 up and played out the remaining ten minutes to win the game and keep our double hopes alive. I have to commend Tottenham for their performance and would understand their fans feeling like they had been robbed. In our defence, they only had four shots on target in the game despite their dominance. They were the better side for the most part but it's goals that win you games and on the day we scored FOUR against the best defence in the Premier League. Chelsea demonstrated once again a willingness to dig in and grind out a performance in the big, big games. I had asked our big players to deliver and they ALL did. Every single player worked hard and played their role. Nathan Ake was superb and credit to him for stepping in having not played much since his return from Bournemouth. David Luiz deserved his Man of the Match award because he was everywhere closing people down, winning tackles, making blocks or to just cover a run in behind to blast the ball high into the stands out of play to give us a chance to re-group. He really showed how disciplined he has become under Conte. So we now take on Arsenal in the FA Cup Final and judging by their new three at the back formation, compared to how advanced and how much we implement it better, we should be full of confidence heading into the Final.